Caroline Penn, one of the Society’s Committee members, made her own notes about the Beeston Continuum meeting held on the 9th May 2014. Alongside this website’s officers own amateur photos – they make for a good record of the discussions that evening. Please do comment on this post with your own reflections! Nick Palmer was the first to speak. He said there are 3 phases to the regeneration of Beeston. First is this year and consists of the Henry Boot development and the Council proposals. Phase 2 will be the rest of the land left after the tram route is completed, the choices made there will determine prospects for up to 20 years. Phase 3 is the long term development of Beeston as a whole building on whatever has already happened. What can the council do, they only have the ability to attract investors on the basis of planning and to direct the direction of things. The hope is that after this meeting there will be a continuing process for people to keep in contact. 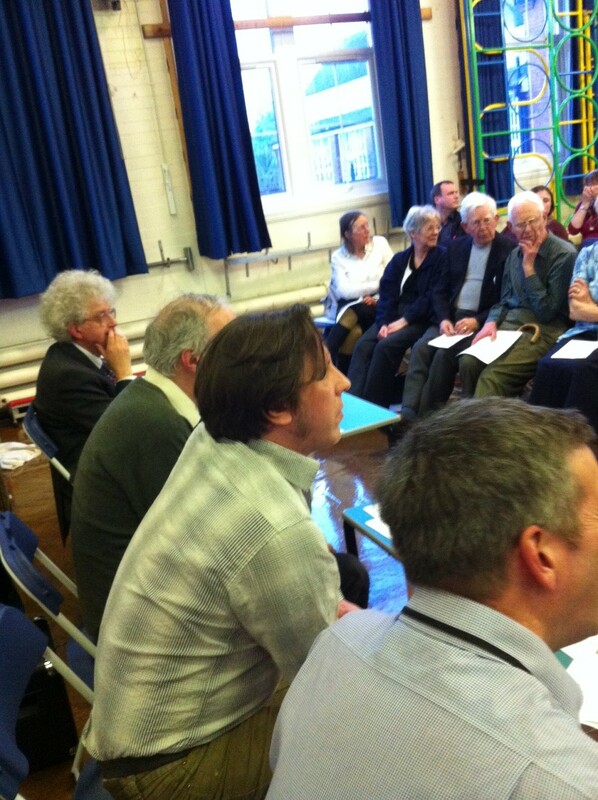 Martyn Poliakoff introduced himself as someone who has lived in Beeston for 35 years, and speaking as a resident. He wants to address peoples ignorance of Beeston, and likes the Council’s idea of a big screen and free wi-fi. Then went on to say that what we really need is a shared idea that everyone in Beeston can contribute to. It is his idea to make Beeston a sustainable town, we have the opportunity now to let everyone buy into this idea from the tram people to school children. It also ties in to the University where there are some sustainable houses. We have a site where there could be an iconic building which could make everyone think sustainably. He would like a roof garden on top of whatever is built. The University has 600 architecture students, and Prof Poliakoff has already talked to the university about them doing a design project, with there being an exhibition of ideas that could inspire potential developers to think differently, this could lead to something quite exciting. Companies that are interested in sustainability could be interested in basing themselves here. It could persuade the large supermarkets to get involved with sustainability. This proposal doesn’t cost much money but is more about getting people in the frame of mind to think about such things. The University hierarchy (pro VC etc) is very interested in the opportunity to get involved in this way. Many things cost money but this proposal won’t involve costs, and once there is momentum people will buy into it. John Delaney then spoke. Broxtowe borough Council is already looking at a whole range of things to coincide with the tram and Henry Boot completions. Phase 2 will be hugely interesting, they have already seen some bad proposals. The Council will not provide funding, the developer will and will have to make any scheme financially viable. There has to be a balance between grand vision and the developer. A report about the Bus Station in the Nottingham Post was not quite correct. There will still be a bus facility with 6 stops, but it has shortcomings and the decision will be made by elected members (Tuesday night Cabinet), a third of the potential development site will be lost if the current Bus Station stays. Meeting then thrown open to the audience, and many comments were made. Steve Barber commented that we will be getting a good new bus station as part of the tram, he thought Martyn’s idea was really terrific. MP responded the ideas are important, even if real companies can’t do what the students have come up with it will be a stimulus, could have a hotel for example and as there is a transport interchange there won’t be a need for much car parking. We want to get people prouder of Beeston, it is our duty to make Beeston exciting for future generations. A local trader then asked if there are already developers with plans , the High Road is being left out, there is not much of a draw there, would like to see the market there as in Long Eaton, and was worried that traders there wouldn’t get anything. John Delaney responded that the market couldn’t move there because one side of the road has to be kept clear for emergency vehicles. Developers are already coming forward with plans for phase 2, they have seen plans for open space and 3 ”retail shacks” with car parking, there will be many visions but there will have to be compromise. Martyn Poliakoff stated he has a vision of an an axis from the University to Central College and the Station to the Nurseryman, we want all Beeston to thrive. Robin Phillips stressed the need for efficient sightlines in the new bus station. There was a suggestion that money shouldn’t hold us back but that we should borrow it. Martyn responded that the University might be able to leverage money from the EU for sustainability things. 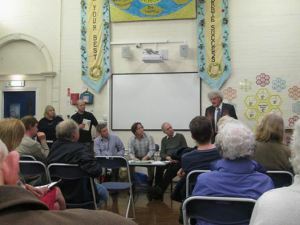 Another member of the audience pointed out that it was easier to get from Nottingham station to the University than from Beeston Station and that there should be a link from here to the University, John Delaney then mentioned that the Council is currently working with Network Rail. In response to a query about how sustainability could be enforced John Delaney pointed out that the Council can stipulate what it wants to see and set standards and set them quite high. There followed a suggestion that the Council should visit places such as West Bridgford to see what they are doing that’s right. Cllr Carr commented that he liked the idea of sustainability, we could tie it into Bees for Beeston, and that people in the north of Beeston now walk to the A52 to catch a bus and go into Nottingham because of poor bus service to Beeston centre. He also mentioned that he is a member of the Town Centre Working Party. A comment was made by someone keen on the idea of becoming a cultural centre. Beeston has lost Barton’s activities and Poets in Beeston. Cultural events have to keep going on, but it doesn’t have to be great things, but keeping things alive at night. Children need to be made more aware of Beeston’s history and past. Kate Foale asked was it worth learning more about the Centre for Alternative Technology to use their ideas. Martyn Poliakoff responded that with a population as large as that of Beeston we have to find ways of making the modern way of life more sustainable. There was mention of an online petition about bus services which is soon to be set up. 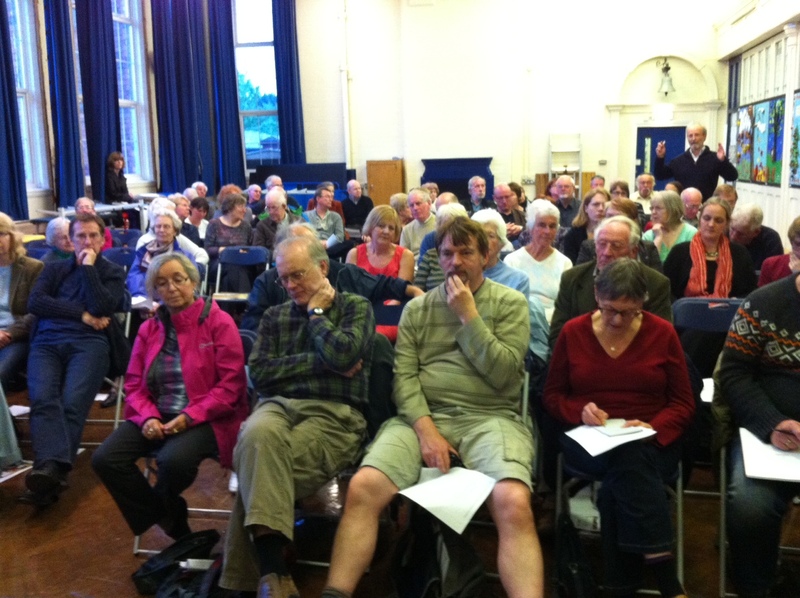 Beeston is not dynamic by southern standards, is it because people are younger in the south. We need to keep a high bar and insist on things to bring inward investment. Need to seem welcoming when people arrive, hanging baskets etc. John Delaney said that the public toilets were a dilemma, there is a scheme to do a minor tart up but it is public investment and it’s a site for development, replacement toilets would be written in to a developer’s brief. Andrea Oates said she would feed back to the Council’s Climate Change group. There is a move to get a Book Festival going in Beeston. There is a need to get young people involved , Councillors are too old. John Currie (Beeston Film Festival promoter) The work life balance is good in Beeston, we need to get back to it, not have gimmicks or be guinea pigs. The final comment from the audience was about shops which no-one had really mentioned before. It was felt that there should be work towards bringing shops back on the High Road which has a lot of low value shops, the quality needs to be raised.